Fall is officially here and I realized that I need some apple recipes to enjoy. I have been working on an apple crisp recipe for some time now and it is time to dust the flour off of it and perfect it. This Gluten Free Vegan Apple Crisp recipe with oatmeal is so flipping amazing that it was really hard to not have seconds. I was so full that I just couldn’t, but that didn’t stop me from licking the spoon when I was done cleaning up the mess. This post contains affiliate links. If you make a purchase through these links Living Freely Gluten Free makes a small percentage. This income helps to cover the cost of running the site and helps to create delicious and easy recipes. Thank you for your support. 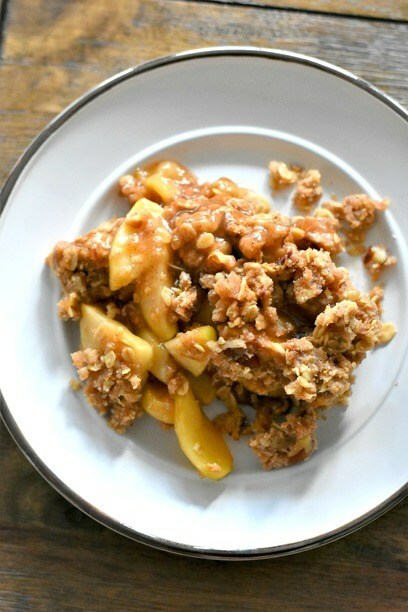 Gluten Free Vegan Apple Crisp is always an easy alternative to making a pie. Even though I have an amazing pie dough recipe, sometimes I just don’t feel like rolling out dough. Who can resist a good crumb topping either? I am a sucker for crumb and this apple crisp recipe with oatmeal makes the perfect crumb topping. I used Honeycrisp apples for this recipe and I loved the way they turned out. The apples were tender, but not mushy, and had the perfect amount of sweetness. There was a gooey sauce surrounding the apples and the crumb on top made it absolutely perfect. This recipe is also Grandma Olga approved. She loved it! It only took me about 25 minutes to throw it all together, with the majority of that time being the peeling and chopping of the apples. I really need one of those apple peelers, it would make my life easier. How do I make this Apple Crisp recipe with Oatmeal? You will start with peeling and slicing your apples. I used about 6-7 of small to medium apples. Add the apples to your bowl and then add the rest of the ingredients, mix well. Grease a baking dish. I used an oval 11 inch for this. Pour your apples in and spread them out evenly. Preheat the oven to 375ºF. Make the crumb by adding all of the crumb ingredients to a bowl and use a pastry cutter to blend it all together well. Spoon the crumb on top of the apples and spread it out evenly. Bake for 35 minutes. Serve this with pumpkin ice cream and vegan pumpkin caramel for the optimum dessert experience. 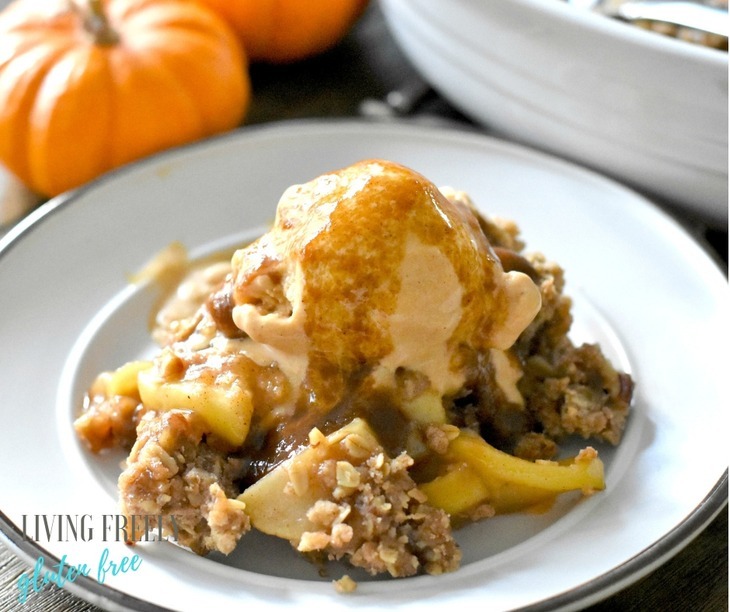 You are going to love this gluten free vegan apple crisp! Enjoy! Slightly sweet with lots of gooey apple flavor- this will quickly become a family favorite! In a large bowl toss the apples with the brown sugar, flour, cinnamon, and nutmeg. Grease the baking dish. Pour the apples in the baking dish. For the topping add the flour, oats, cinnamon, nutmeg, vegan butter, pecans, and brown sugar into a bowl. With a pastry cutter blend all of the ingredients very well. Spoon the crumb evenly on top of the apples and bake for 35 minutes. Serve warm with pumpkin ice cream and pumpkin caramel sauce. Like this recipe? Then you will LOVE my cookbook with over 100 gluten and dairy free recipes that are for your entire family, even those who are not gluten free. Head HERE to order your signed copy. Have you joined my Facebook group yet? It’s a safe place for support to help navigate you through this lifestyle change. Head HERE to join. The flavours of fall are some of the most delicious. Apple season is one of my favourites. 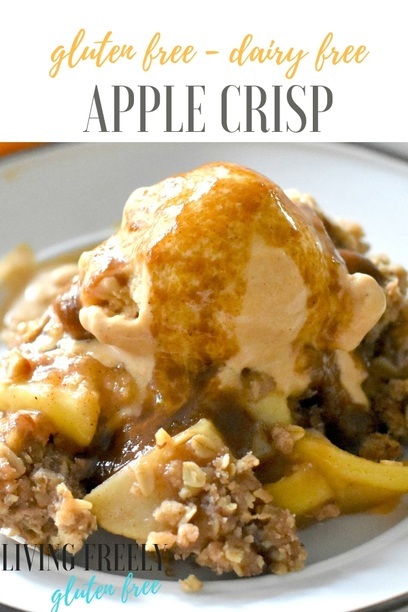 This dessert is a great way to enjoy them….and I know my family LOVES apple crisp. Thank you Gloria. Fall flavors are the best! Um if a Grandma Olga approves, it HAS to be good. Honeycrisps are my favorite apple and I love how you don’t miss the gluten or animal products at ALL with this. SO good. Thank you Tracy! As a family with food allergies I love accommodating as many as I can with dishes. Omgggggg how good does this look! I was just thinking last night that I might actually make dessert this year for our Friendsgiving festivities, and I was thinking an apple crisp because I’m not much of a baker. (I need something approachable.) Now I *know* I’m making this. Thanks Dana. Everyone will love this and its super easy! This couldn’t have come at a better time! I’m heading to a get together soon where I’m bring dessert and we have a GF pal attending. This will be perfect for everyone 🙂 This look absolutely delicious! 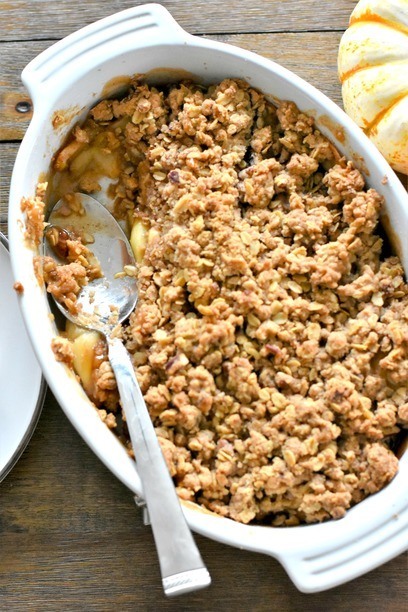 My husband LOVES apple crisp, and I’d never even heard of it until we got married! I like that this version is vegan- I hate how much butter is normally in it. And honeycrisp apples are the best! You will not miss the butter at all! This recipe is pretty clean and tastes amazing! Mmm I am getting in the fall mood just by looking at these photos!! I’m not gluten-free, but have plenty of friends who are, so I’ll have to save this for a future dinner party. And yes to honeycrisp apples!! OMG! The crisp looks amazing. Ever since I first tasted apple crisp in school I’ve been a huge fan. My mamma didn’t make desserts like this, hers were a bit more like a strudel. I love the simplicity and the oatmeal crunch on top. Honeycrisp apples are the best, aren’t they?! Think I’ll make this crisp this week. Thank you Marisa. The Honeycrisp is perfect. I love the simplicity too! 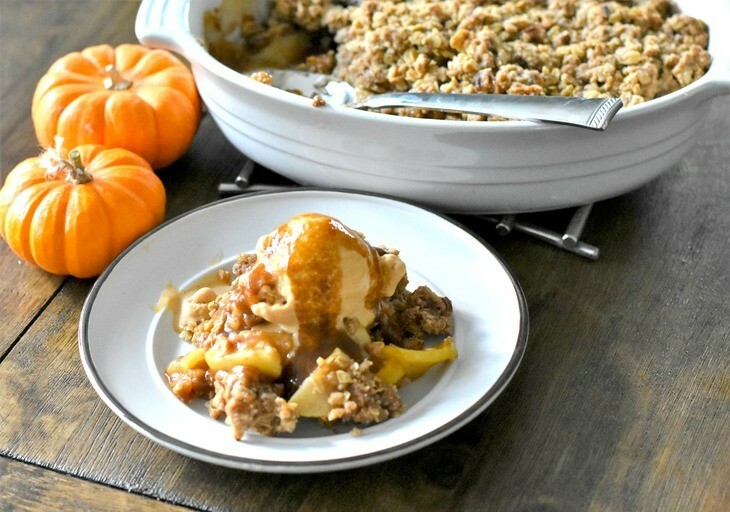 Apple crisp is one of the coziest fall desserts! I love to make it after a trip to the orchard. It’s so great that you’ve made this gluten free! I have several friends who follow gluten-free diets, and I’ll definitely save this to make when they visit this fall. 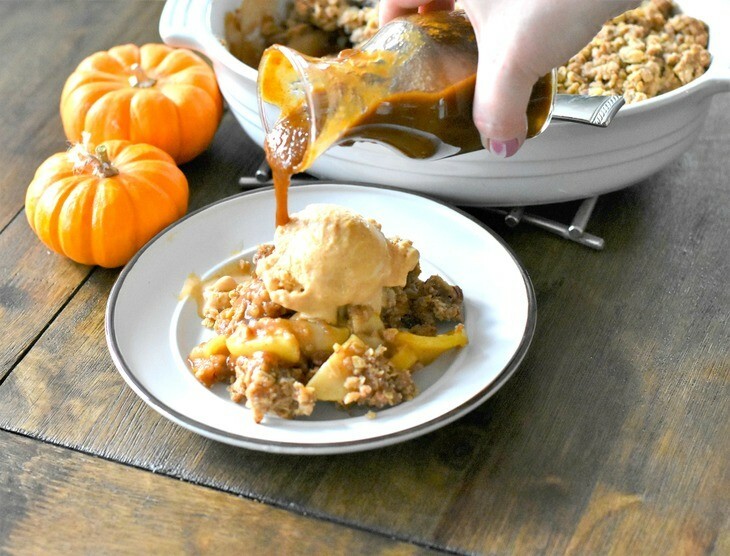 The pumpkin ice cream and pumpkin caramel sauce you served this with just takes it to the next level, too! So perfectly indulgent. Thank you Amanda. I have been wanting to pick apples and make this again. Have a great day! Can never go wrong with a tasty apple crisp. I love how simple this recipe is and it uses ingredients I already have. Win-win…and those apples were begging to be baked! Thanks. Love that this is not only a gluten-free dessert but also vegan – thank you so much for sharing this allergy-friendly recipe! We still have lots of apples leftover from apple picking and it’s a great way to use them up, yum! Thanks Courtney. I try to cater as many food restrictions as possible with the best results. Have a great weekend.